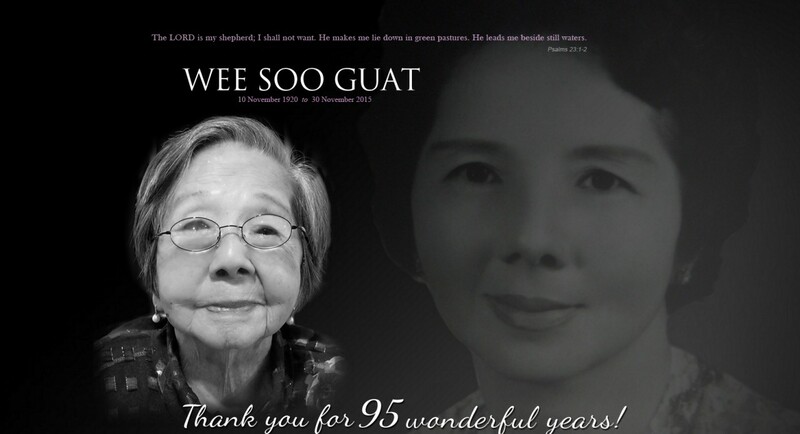 This blog post originated from a eulogy delivered at the wake of the late Madam Diana Wee Soo Guat (10 November 1920-30 November 2015). My Amah and Me - Celebrating 95 Years of God's Faithfulness. 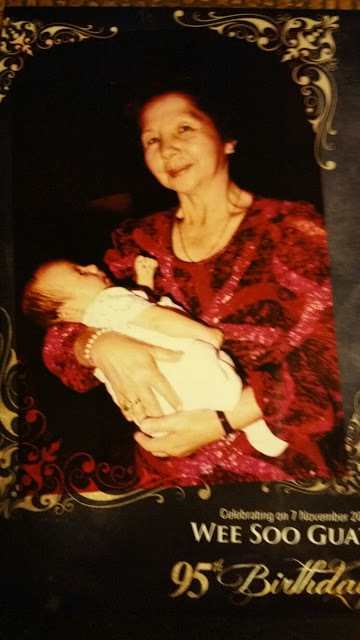 It is now early in the morning; the day when I will say my final goodbye to my grandmother, who passed away earlier this week, at the grand old age of 95. I recall the events of the past week, and I am thankful that the tears of yesterday have given way to the smiles of today. My grandmother, Wee Soo Guat, has lived a full life, and I am happy that she has now gone to a better place; one without suffering; one without pain. I choose to remember Amah through the food that she cooked; something that all our family members have talked about and something that all of us will remember as long as we remember our Amah. Indeed each of the food items she cooked represents one aspect of the Tan Family matriarch. by his side for better and for worse. Amah was famous for her achar, the traditional pickled mix of cucumber and carrot marinated in a blend of vinegar and other spices. This was a special delicacy that Amah made once a year and distributed to all her family and friends. To me, achar symbolised Amah's generosity, and family members shared that after all the hard work of preparing the pickles, that they sometimes did not even end up with even one bottle. My Amah was exuberant in her generosity, and gave all that she had to everyone whom she knew (and even to strangers). Bakwan Kepiting. This Peranakan dish, often prepared during family gatherings, comprised minced pork mixed with crab that was spooned together in a special manner. This would then be stuffed back into the crab shell, and either prepared with bamboo shoots in a delicious broth, or deep fried to perfection and enjoyed with all its crispiness. The dish represented our close family gatherings that we used to have once a week, first in my Uncle Wilson's home at Hythe Road in Serangoon Gardens, and then at Mt Sinai in the Holland Road area. 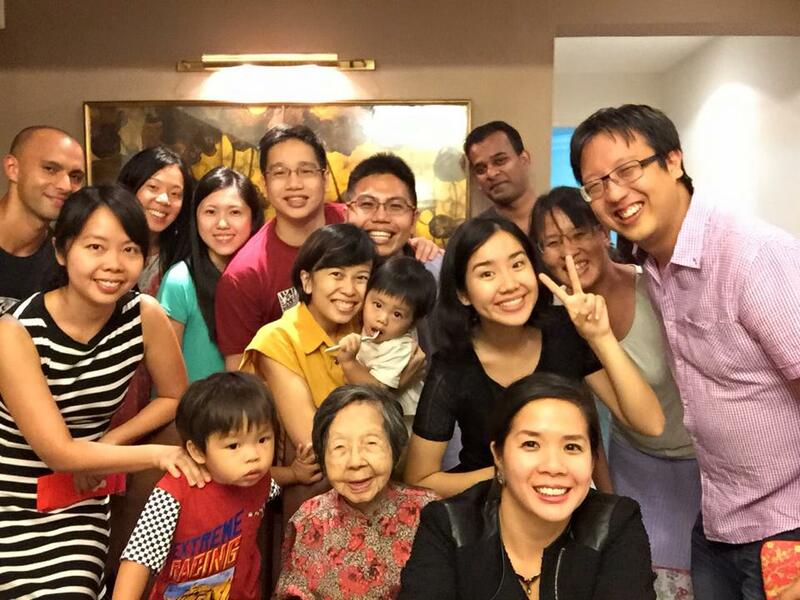 These were precious moments when the extended family would gather every week and enjoy the food and warmth of family. My Amah loved her family and she always ensured that everyone ate well, and that everyone was kept closely knitted together. The grandchildren and great grandchildren today. I cannot remember when, but one day, these weekly gatherings stopped. I was sad; but thankful that the family remained close, and continued to meet during regular gatherings at Christmas and Chinese New Year, as well as on other special occasions. One dish that would characterise this season of life was mee siam. My Amah's version comprised a delicious selection of side dishes such as sambal udang and sambal sotong (chilli prawns and squid), that would be served alongside the staples of bee hoon, sliced boiled egg and twa kwa. Amah's fried beancurd had to be cut into small pieces and fried to a crisp. Only then would the mee siam be representative of a bona fide Amah-style dish. Then there were the more personal dishes. Amah loved each of her grandchildren in a different way. For me, it was through the food that she prepared for me to take home to eat. As I lived alone for many years during my time in university, this was particularly precious for me. One such dish was nasi ulam, an unusual dish even by Peranakan standards. This special seafood-based dish is a complicated one to prepare, with its numerous ingredients of white flaky fish, small prawns, crabmeat and a unique spice. One memorable incident was when I took the dish to school, to enjoy it as I studied. I remember that one of my good friends happened to take a whiff of the food, and he remarked that it was especially pungent. He still wanted to try the dish, since I told him it was a one-of-a-kind dish prepared by my Amah. So I continued to do my work, and when I looked up I realised that all the food was gone! My friend had apparently wolfed down every single grain of the nasi ulam! My Amah was also known for her glutinous rice or zubi peng. This was something that I had always loved in childhood; but something that my wife Sue had never eaten in her life. She however grew fond of the sticky rice, fried deliciously with small prawns (hae bee), and sprinkled generously with peanuts. To me, zubi peng represents how my wife has came to love my Amah, and how Sue grew fond of my dear grandmother during the ten years or so that she has known her. legacy that they have left us. Chinese New Year as a family. For me, I will always remember Amah's fried onions and chopped garlic. Amah knew I loved to cook, and that it was sometimes hard to do so given my busy life. She therefore made it a point to prepare fried onions and to peel and chop garlic for me every time we met for our family gatherings. These condiments made it easier for me to cook, and till today I still have these ingredients ready in the kitchen. My children have become fond of these condiments, with my older son Z constantly asking for fried onions whenever we eat noodles or fried rice. As for my younger son E, he loves the chopped garlic pieces deep fried, and would often eat them on their own, even when they are served with fried egg or other dishes. In John 4:34, Jesus said that "My food... is to do the will of Him who sent me and to finish His work." This verse was spoken in the context of a later verse talking about the importance of outreach, when Jesus asked his disciples to look at the harvest; to realise that it was ripe and plentiful but that the workers were few. Jesus had a heart for those who did not know God. So did Amah. She went to church from the age of 12, and was baptised at the age of 16. 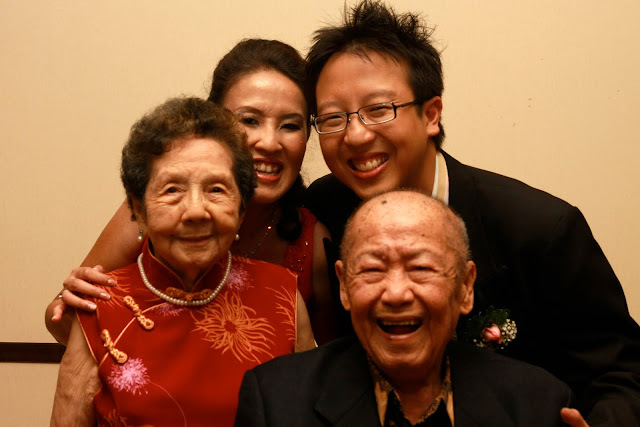 All her life she attended one church, Telok Ayer Methodist Church; and she often emphasised how important it is for everyone to know Jesus and to go to church. In fact when I first told Amah I was getting married to Sue, my grandma remarked, "Sue is a good girl. She loves Jesus." That, to her, was the most important. And I can appreciate the wisdom of that statement. she was beaming from ear to ear! During her 95th Birthday celebration, just two weeks before her death, Amah shared with Sue what was to become her last words to our family. She told Sue to "always read God's Word to your children." Sue replied that we have been reading God's Word to our sons each night at bedtime, and Amah was pleased. We are thankful that both our children have chosen to receive Jesus as their Lord and Saviour. This, I believe is Amah's greatest legacy to us. She was a third generation Christian, which makes our children sixth generation Christians. What a rich legacy! We were especially thankful when 5-year-old Z prayed for Amah during her time in hospital. He declared," Dear God, Thank you for choosing Cho Cho. She belongs to you." My son has been asking why people do not want to know Jesus, and Sue has been encouraging him to pray for them. Our desire is for our children to take ownership of their faith, and to live lives pleasing to God, just as their great grandmother did. And we know that Amah would approve.